Known for its beautiful white sand beaches with crystal blue water and density of visible tropical wildlife, Manuel Antonio is any traveler’s dream. If fact, your Costa Rica vacation would not be complete without at least stopping by this wonderful natural park area. At just a little under an hour from downtown Jaco, this is one of the absolute best Jaco area tours that you can spend a day on! Manuel Antonio is located just 1 hour south of our hotel and condos, Marea Brava. The over 7500 square miles of protected area is teeming with wildlife. Common up close sightings of: three-toed sloths, white faced monkeys, howler monkeys, two-toed sloths, tucans, squirrel monkeys, boas, pacas, deer and anteaters. Travelers can hire a group guide for a fair price to help spot and identify the different animals in the park (he/she will bring a spotting scope for you to look through). There are miles of trails to discover wildlife close-up with your very on eyes. Check out some of the other Costa Rica National Park Tours that you can do! 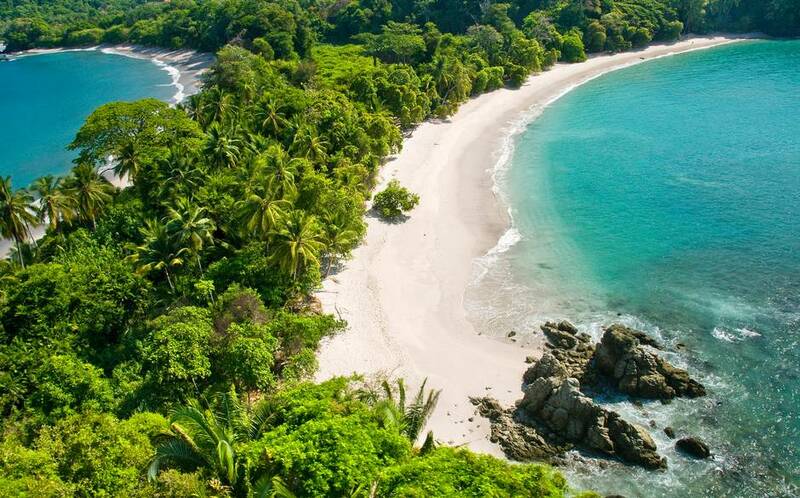 There are four main beaches: Espadilla Sur, Manuel Antonio, Escondido and Playita. Three of these beaches are hidden gems that you can take short hikes to reach. All of them hold pristine white sand hermit crabs and beautiful, warm water. Manuel Antonio itself is just a small strip on the beach with a few restaurants and bars/ night clubs and a couple of hotels. You can hang out and sip cocktails on Manuel Antonio‘s main beach and hope the Capuchin monkeys don’t steal your glass. At night there is a fun beach-party atmosphere, but even if you stay near to town, you will still find peace and quiet as Manuel Antonio is literally a one street town. The port town of Quepos is located on the way in to Manuel Antonio, just 5 minutes on the opposite side of the hills. Here you can find plenty of affordable places to stay, various restaurants (everything from local style to Sushi) and vibrant nightlife. If you love to fish, there are plenty of charter boats to book out of Quepos where the sportfishing is excellent! As we said in the begining, if you visit Costa Rica, you must spend a day in Manuel Antonio. Forbes listed it as one of the top 12 most beautiful parks in the world! *Check out our Jaco Costa Rica Rentals and venture to Manuel Antonio with us! Why Visit Jaco Costa Rica?